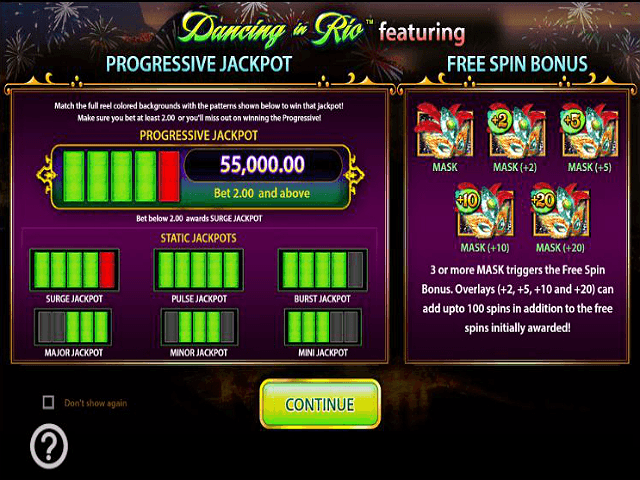 What do you get when you cross jackpots with the Carnival in Rio de Janeiro? 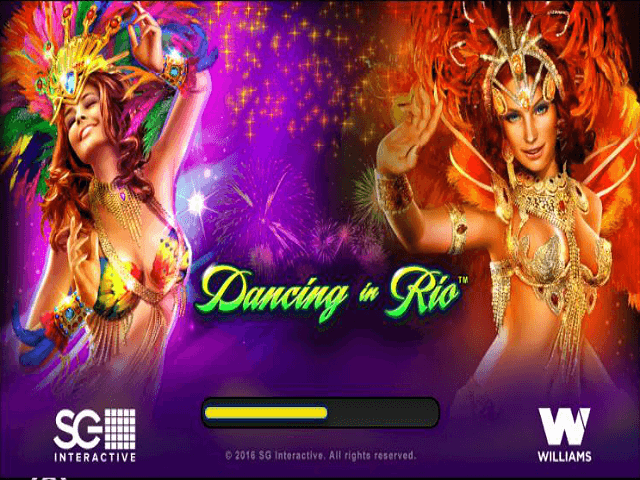 The answer is Dancing in Rio, the first progressive jackpot slot from American software provider WMS Gaming. Expect to dance the streets in celebration if you win one of the jackpots on offer, while the Free Spins feature just adds to the fun. So dig out your dancing shoes and let us show you the right moves. Read on to find out exactly how to become the king or queen of the carnival. WMS capture all the colour and excitement of a carnival in this online slot's vibrant design. 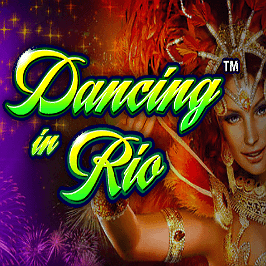 This title has been around in Las Vegas casinos for a while and is now available online, too, so players can experience a taste of Brazilian Carnival no matter the weather. The layout is quite different to other slot games; various jackpot amounts are displayed on the right, alongside a pop-out menu you'll open to set your coin value and paytable information. A burst of funky samba music accompanies every spin before fading out, encouraging you to keep the party alive. The symbols are fairly standard, with a mixture of card ranks and carnival dancers. Keep your eyes peeled for the Rio queen: a stacked symbol taking up a whole reel, and paying out £7.50 if you get five. The Wild symbol is the Dancing in Rio logo and replaces all other symbols except the Scatter to create winning combinations. The number of paylines is fixed at 40 so all you have to set is your stake. Betting starts at 40p and once it reaches £2 it goes up in multiples of two all the way up to £50. The more you bet the more you put into the jackpots, but we’ll look at them later. 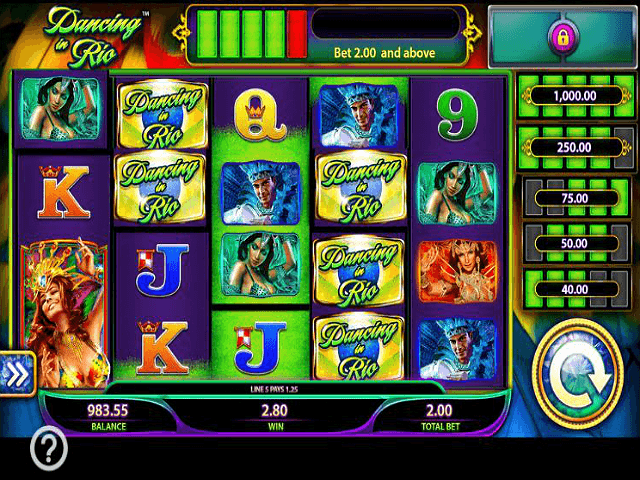 Dancing in Rio features a Free Spins game which is triggered by landing three or more of the mask Scatter symbols anywhere on the reels. You’ll get 10 free spins for three symbols, 20 for four symbols and 50 for five. In addition, if you get four Scatter symbols your winnings during the Free Spins are doubled, and if you get five the multiplier goes up to 5x. Sometimes the Scatter will have a number attached to it, either 2, 5, 10 or 20. If so you’ll receive that number of extra spins. You’ll notice when you start spinning that some of the symbols appear against a green or red background. This relates to the jackpots that are up for grabs in the game. You need the reels to be filled with the green trigger background to be in with a chance of winning one of the six jackpots or the Progressive, with different combinations corresponding to each jackpot. For example, to win the Burst Bonus Jackpot, you'll need the first four reels filled with green. The final reel can also possess an entirely red trigger background. If the first four reels are completely green and the fifth reel is red, you’ll land the Progressive Jackpot. (You must bet £2 or more, however). If not, you’ll win the Surge Jackpot. A display at the top will tell you whether the Progressive or Surge is in play. Jackpots can be won during both the base game and Free Spins feature. So get into the carnival spirit and start spinning to be in with a chance of winning one of seven jackpots! 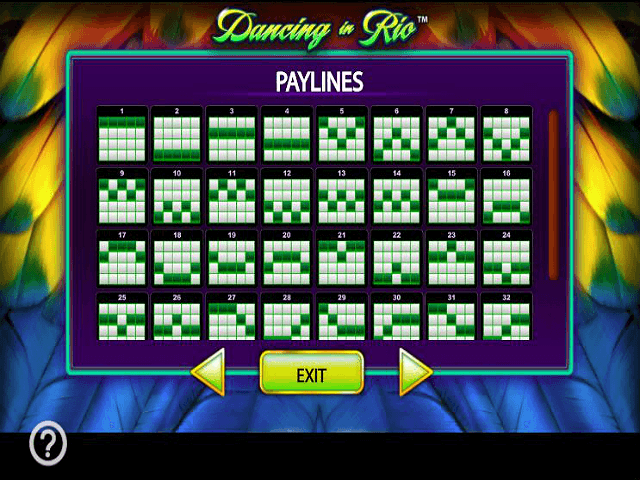 If you like Dancing in Rio - You'll like these slots too!